Since I already wrote about Music Week in an email to elementary school parents, I was going to write about something different this week, but I just returned to my office after the 2nd grade performance and felt that I had to write about Music Week and the beauty of elementary school performances. The entire 2nd grade gathered on the stage to sing, “If You’re Going to San Francisco” at the end of the show. The group had likely practiced arranging themselves on stage for the final number once or twice if they were lucky, as we only have the stage for the week of the performances. But this was the beauty of the moment. Each individual personality came through – directing, helping each other, wiggling, smiling, nervously looking into the lights, standing stock-still, waiting patiently for everyone to get it together, each child had his or her own way of managing the situation. These are the moments in which children learn and use many skills - interpersonal, intrapersonal, spatial orientation, etc, etc. They did it, arranged themselves quickly in one big group of 50 something students on stage, and threw themselves into the song I had heard snippets of in the hall for the past month. Singing their hearts out, they came together in their multitude of beings, the San Francisco skyline projected behind them. Some read the words, some searched for moms or dads in the crowd, some smiled as though they had been born for the stage, but they all participated with intention, pride, and joy. I got a little teary-eyed, so proud of these little people for performing with such happiness and shining so brightly. 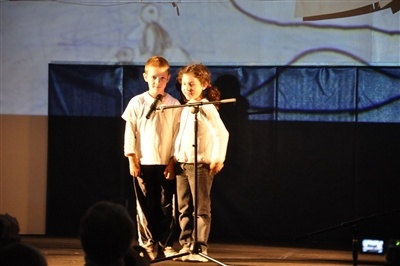 It is the bumps and mistakes and imperfectness of elementary school performances that make them so wonderful. We worry about the fact that a song skips, or a child forgets to grab a mic, or another starts too soon or too late, but in the end, it is a beautiful demonstration of all of the energy, effort, and joy that run throughout students and our school. Jean-Baptiste and Su work so hard, and get so much out of a single hour a week with each class. Despite the challenges of schedules and space, they pull together performances that allow our children to experience music on stage and unite our community. A perfect example of engaged learning that helps a child develop on so many levels. Of course, I was so engaged in watching them, I didn't think to take a photo! Above is a photo of the 1st grade performance taken by someone on Wednesday. Sorry! As always, if you have thoughts, comments, or suggestions, please email me.